The rocket is the most recognized icon of the South Carolina State Fair. Meeting family and friends there has been a tradition for nearly 50 years. "Jurassic Park" was created from 75 tons of sand. 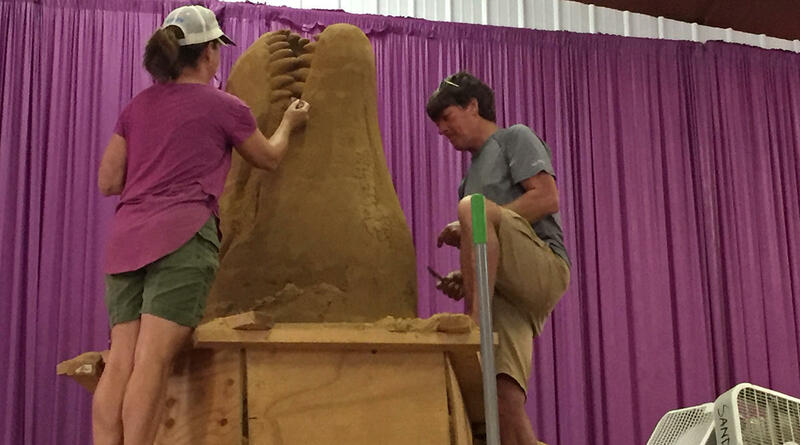 Visiting the sand sculpture has become a State Fair tradition for many people. October brings many things to South Carolina - more football, turning leaves, cooler temps (we hope!). And one of the fall's most anticipated events is the South Carolina State Fair. Long-time fairgoers have established many traditions they associate with the fair, but "meeting at the rocket" must be at the top of nearly everyone's list. The rocket, according to fair General Manager Nancy Smith, is actually a long-range intermediate range ballistic missle built in the 1960s and designed by legendary rocket engineer Wehrner von Braun. It was named Columbia, and was eventually donated to the city of Columbia and erected at the state fairgrounds in 1969. For nearly a half-century, the imposing structure has been a meeting spot for parents and children, friends and other fairgoers. Near the beginning, a dinosaur begins to emerge from a frame packed with sand. Smith says people have fond memories associated with the rocket - some got their first kiss there, some met their future spouses there, or even married near the rocket. The rocket has seen many things over the years and Smith says she can't imagine the fair without it. But she's not in danger of finding out. Glenn added that she can't imagine doing her unique job without doing it annually at the State Fair. Between these traditions and more, it seems the State Fair has become the home to icons of the Palmetto State.